Explanation: Rich in star clusters and nebulae, the ancient constellation of Auriga, the Charioteer, rides high in northern winter night skies. Composed from narrow and broadband filter data and spanning nearly 8 Full Moons (4 degrees) on the sky, this deep telescopic view recorded in January shows off some of Auriga's celestial bounty. The field includes emission region IC 405 (top left) about 1,500 light-years distant. Also known as the Flaming Star Nebula, its red, convoluted clouds of glowing hydrogen gas are energized by hot O-type star AE Aurigae. IC 410 (top right) is significantly more distant, some 12,000 light-years away. The star forming region is famous for its embedded young star cluster, NGC 1893, and tadpole-shaped clouds of dust and gas. 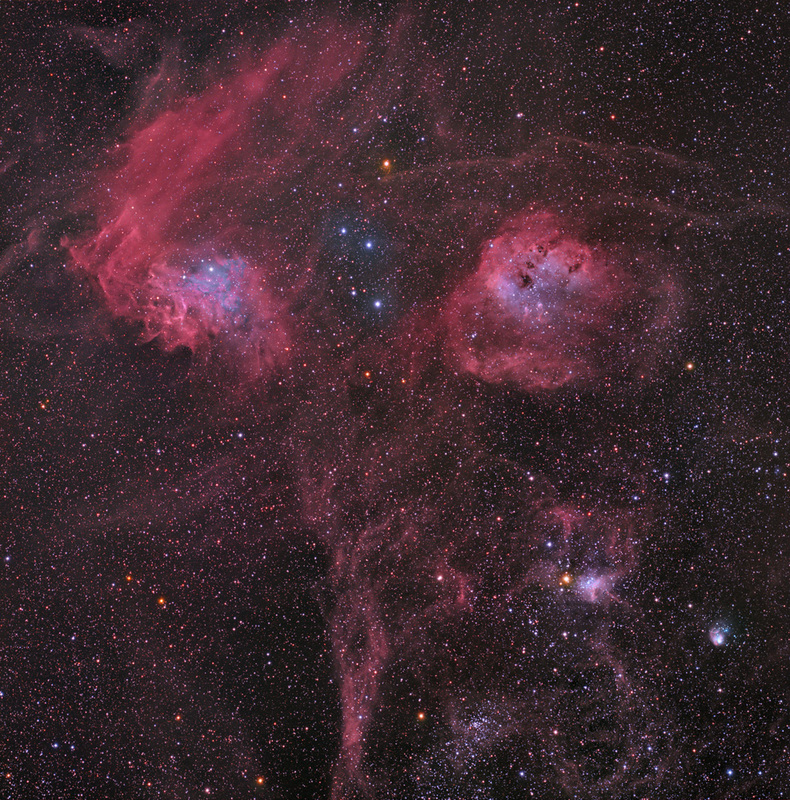 IC 417 and NGC 1931 at the lower right, the Spider and the Fly, are also young star clusters embedded in natal clouds that lie far beyond IC 405. Star cluster NGC 1907 is near the bottom edge of the frame, just right of center. The crowded field of view looks along the plane of our Milky Way galaxy, near the direction of the galactic anticenter.